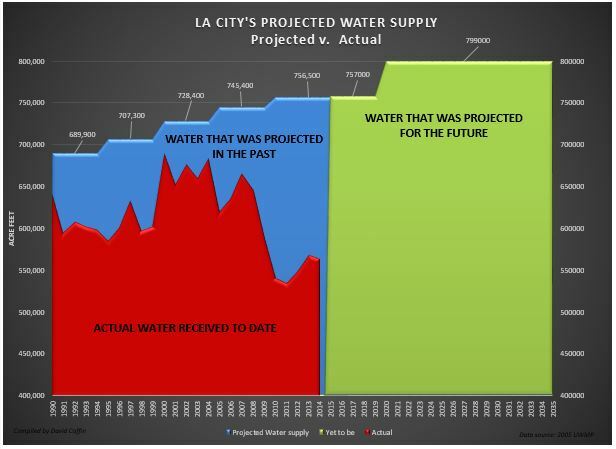 How Effective is L.A.’s Conserving Water by the Glass? 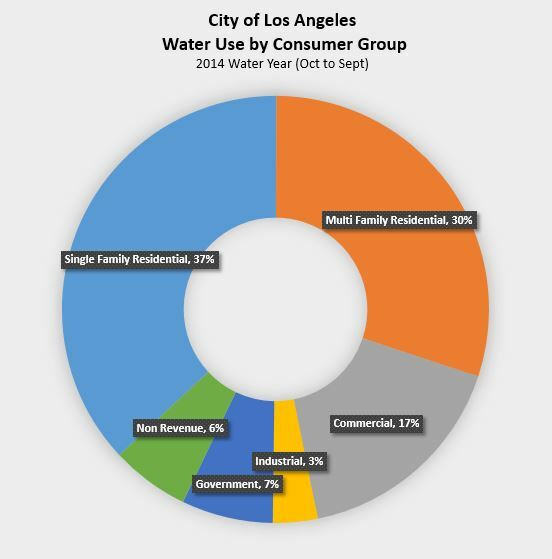 City of Los Angeles Emergency Water Conservation Order regulations prohibit restaurants and other public places from serving water to customers unless they specifically ask for a glass of water. 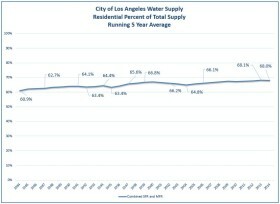 So how much of a reduction of water does this city ordinance make and does it have any practical effect on reducing L.A.'s demand? 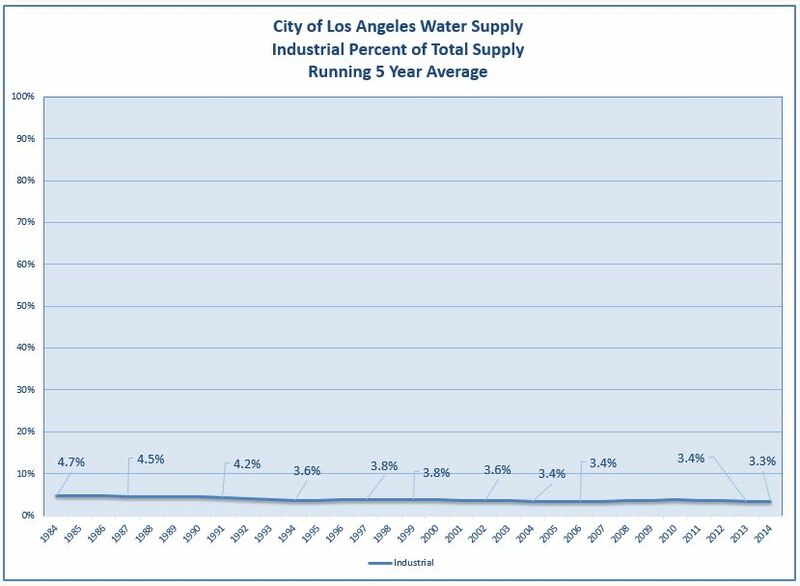 We'll set up an admittedly unlikely scenario where every person 15 years and older in the City of Los Angeles goes out to eat in a 'sit-down restaurant' every other week and has a 16 ounce glass of water served to them. The 2010 US Census tells us there are 2,956,181 people in the city that fall into that age group. 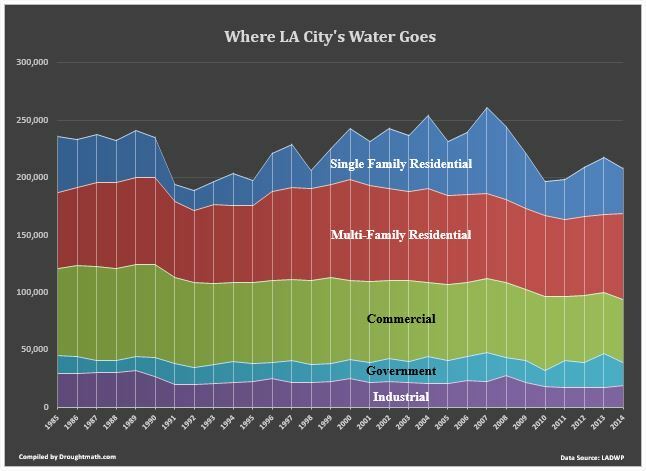 The size of the average glass is probably on the big side, the number of patrons and frequency of eating out is probably a bit high side, but over estimating the demand created by serving water is better than downplaying it for the purpose of this article. 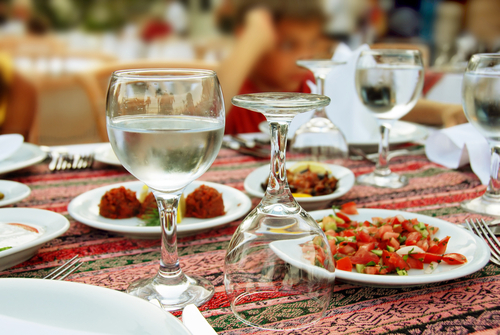 Under this scenario, restaurants would serve about 9.6 million gallons a year. 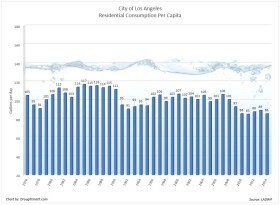 A little more if we add washing the glasses but again, it's highly unlikely L.A. City restaurants with 'waited' tables are seeing 77 million patrons a year. 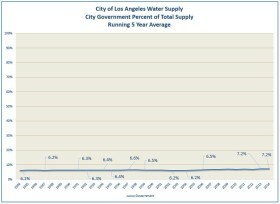 29 Af/y is roughly the amount of water 325 people would use over a period of one year in a city of 4 million. 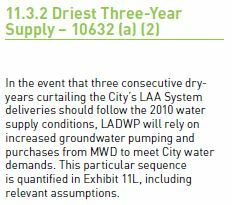 29 Af/y would provide only 9 percent of the 1,444 unit SOLA project projects demand that the LADWP recently recommended for approval. 29 Af/y is enough to support only about 89 average single family residential units for one year in a city with over 627,300 units. 29 Af/y is enough to support only about 140 average multi-family residential units for one year in a city with over 764,400 units. So how much is saved? None really. 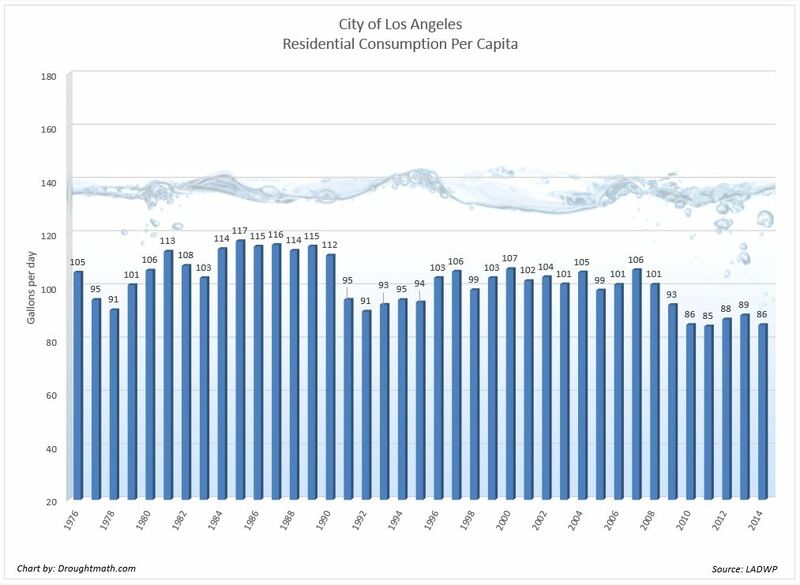 The restriction on serving water to restaurant patrons has no practical effect on reducing demand in a city whose demand continues to grow on a daily basis. 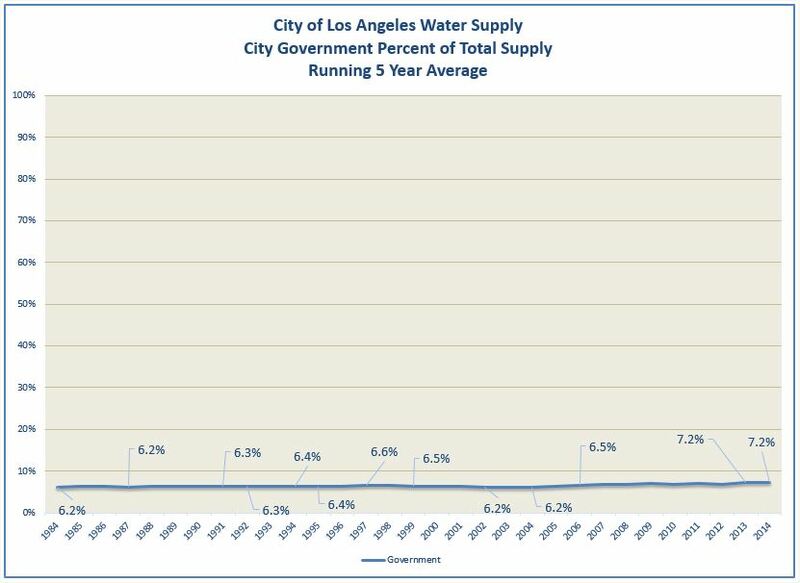 The restriction hasn't helped reduce the city's deficit since it was imposed in 2007. In fact, the deficit has deepened in spite of it. 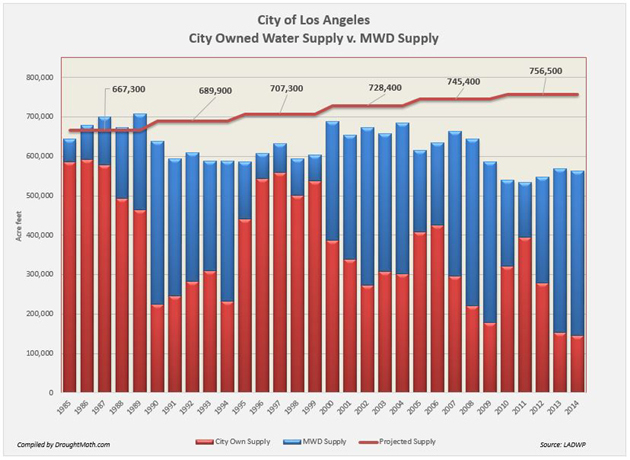 This restriction in the city ordinance is merely a legal reminder that the city has been operating under a water deficit for the last eight years. 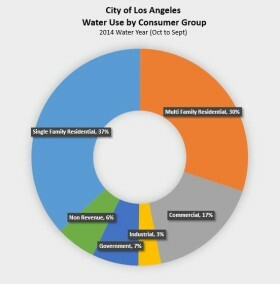 In another earlier post we saw 'how much' water each consumer group in the City of Los Angeles used. 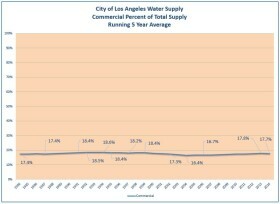 Here is a comparative look at where the water goes by percentage. Next we see both where the growth or reductions in share are between 1984 and 2014. Residential share increased from 60.9% to 68% (12 percent change). 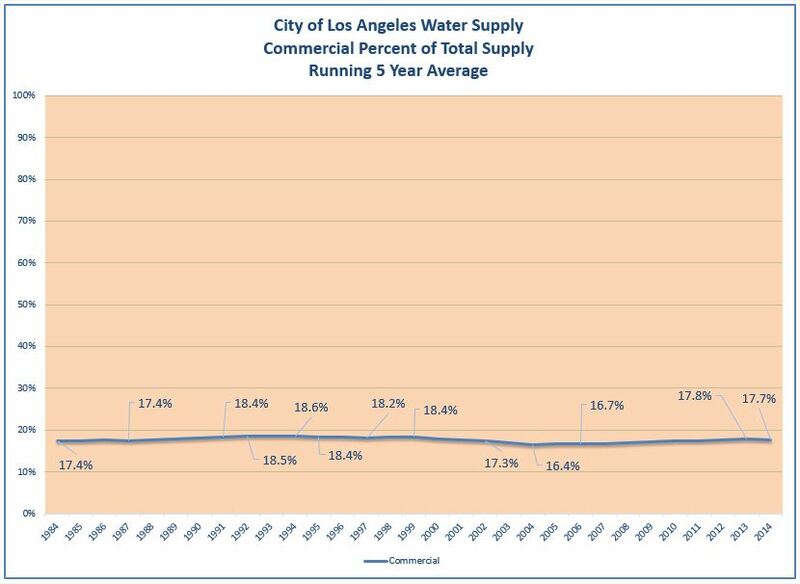 Commercial was relatively flat at .3 percent from 17.4% to 17.7%. 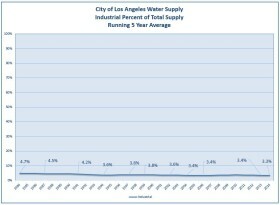 Industrial share fell from 4.7% to 3.3% (30 percent loss) of total supply while City Government increased from 6.2% to 7.2% (16 percent change) of total supply. 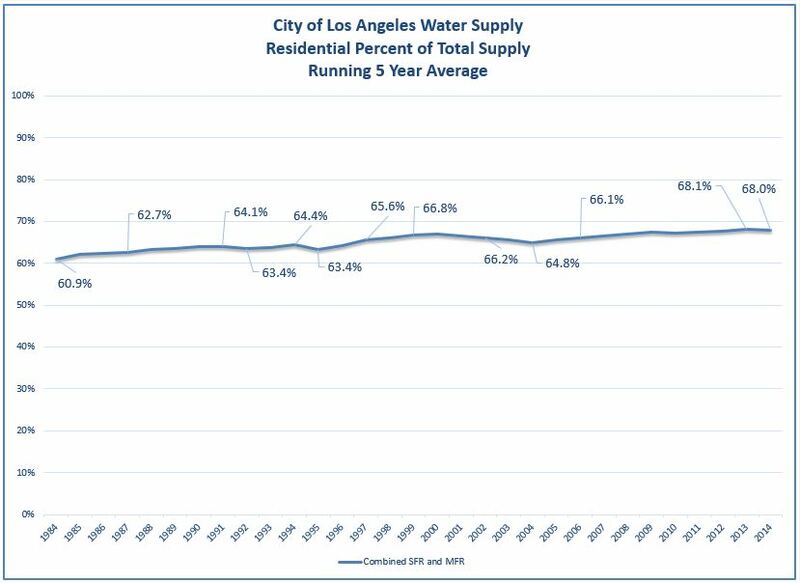 Residential water consumption for the city of Los Angeles between 1976 and 2014. 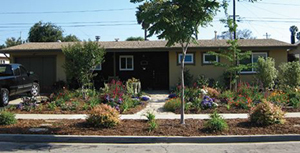 Includes both single family residential and multi family residential.